Drinking coffee is kind of exciting these days because I know first hand that tamping coffee grinds and steaming milk require a fair bit of skill. These days I also need lots of inspiration for all my research papers and little assignments and coffee helps. Last saturday when I worked the barista brewed me a beautiful cappuccino that had perfectly steamed milk. The mouthfeel was so creamy and the natural sweetness of the milk was released to its full potential. Yum. After a week of having kopi C almost every day (that said the uncle at school is so kind to me so I’m a loyal customer!) I suddenly appreciated properly brewed coffee haha. Glad to find that DCC is a reliable place for coffee. Their blend is not as acidic as the liberty speakeasy that C&C uses (well I guess this could be due to other factors and not necessarily the blend) and it has a very robust caramel flavour. They said there’s a citrusy finish to it but I didn’t pick that up. Might have been due to the all the milk that went into my coffee. I do enjoy their steamed milk though. They do it well. 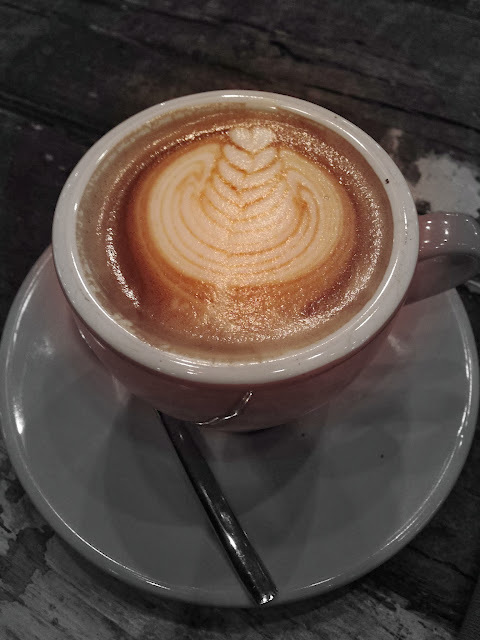 Had a piccolo latte today and I found it to be just right (what is pictured is their cappuccino). It wasn’t acidic to me at all and there was just the right amount of milk, not too much. Next time, I’m going to try their chemex! Not sure if they offer it though I saw the chemex itself on sale.